Here’s a very simple way to store little girls’ hair clips. I have a shedload of arts & craft supplies that I am determined to use up. We had a really stimulating discussion at our Plus group earlier this week – Tom was leading the evening and he had us watch Alain de Botton‘s latest TED talk on Atheism 2.0. I was so glad he chose to do this, and even more glad that I am surrounded in a Christian community that has no problem with the unconventional. Maybe it’s just the imagined (and if I’m honest, villainized) conservative Christian in my mind who would take offense at sitting through what was essentially a very convincing sermon for the other side, instead of looking at the bible at a bible study… I don’t know, I’ve grown up in HK (a cosmopolitan place) and in The Vine (quite an unconventional church). Here we have liberal views on things, I’m told that this is not the case for many other Christians. Whatever the case, no one freaked out – so, go us! What shallow type of faith would be afraid of listening to another (albeit very clever) person’s reasons for not believing? Anyway, I’m coming down with the flu & promised myself an early night so I can’t go too deeply into Atheism 2.0 right now. I will read Religion for Atheists and write down more thoughts in a later post. For now, what I wanted to do was to apply some action to another, unexpected gem that I took home from the TED talk – the idea of the artist discussing their art. I won’t attempt to recap what Mr. de Botton (Mr.Botton?) said about this, so please do take a moment to watch the TED yourself. Again, great food for another post. Now, on to some action. I had met with an wonderful lady in church called Eufemia to pray through some of my life stuff, not overly focused on any one thing, just free styling, if you will… and I ended up telling her about this awful experience I’d had when I was a little girl. The summary of which is that as my family was driving some relatives from out of town back to the airport after their visit, my little cousin started crying and saying she wanted the dress I was wearing. The dress was a recent handmedown from an older cousin. Even as a child I was surprised to find that the adults in the car did not defend me or tell her that her demands were crazy, but instead asked if I would be willing to hand the dress over and spend the rest of the car ride in my undies. I remember feeling totally wronged and going into a tantrum at the horror of the whole situation and then allowing it to become evidence to a growing conclusion that I was indeed, a bad girl. I was not generous enough to sit in my undies. Even though I did keep hold of the dress I never felt like I wanted any rights to it after that. 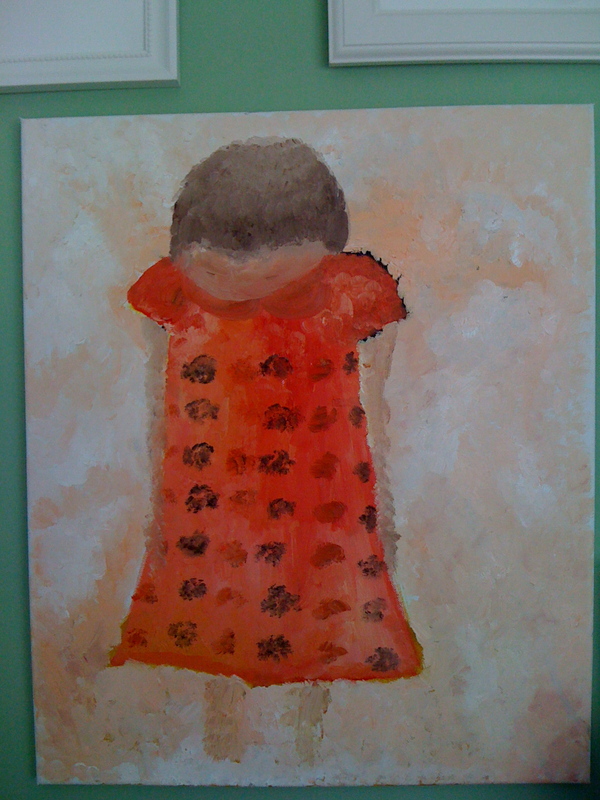 I hadn’t really put much time or thought into remembering the incident, it really wasn’t too big a deal, but after praying with Eufemia I had a sense that God wanted me to know that He cared about it, and that he was asking me to paint a picture of the dress – my dress – in a symbolic gesture to remind me that God sees the little things and is able to restore any loss or damage done to his children, regardless of time. So, that’s the story behind this painting. This is a simple idea I got from an old episode of The Naked Chef. Just had to do it after scoring some delicious fresh Indian vanilla from the very first HmHK DB Farmers’ Market! It’s been a nice day today. I’ve had a busy week in town, so today I decided to don some sweatpants to up my odds of staying home, or at least in DB. It worked. I did take Layla on a two hour outing to the post office, but I feel recharged. The original plan was to do some writing because I got some comments back from my advisor yesterday and so was feeling directed and ready to plunge in again, but then after looking at the calendar and realising I have three whole weeks til my next submission, I thought, why not have a painting day instead? I’ve been meaning to paint because I am thinking about trying to sell some art as my DIY fundraiser for our church building project. I would dearly love to do something physical like run a marathon, but really, I just have to accept that at 35 weeks pregnant, that is not an option for me this time. So, perhaps I can fetch a few bob from a picture or two… we shall see. I really don’t know how to go about doing this, but I have people I can ask. So, today I felt like painting my good friend Clive Staples Lewis. I am very frustrated because he had (what I thought) was quite an easy face, and especially an easy pair of eyes, but I got impatient and put too much oil down and then lost control of the paint and just don’t feel satisfied with my efforts, so then I set myself the never-before-considered goal of leaving a painting to dry for a week or two with the intention of coming back to it later. I am not good at coming back to things. I like to knock things out completely in one sitting – not a virtue. I am learning much. So, after shaking hands with myself to revisit Clive later, I went on to two of my slightly more typical kiddie-styled music pictures. 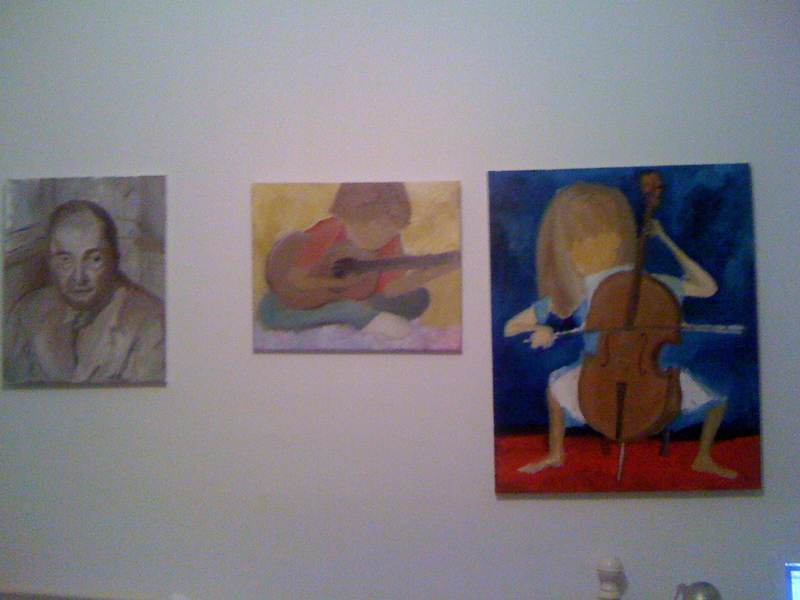 You can get an idea of all three in the fuzzy photo above. Anyway, I fought and won against the temptation to paint into the night and instead cleaned my brushes and packed all the stuff away. I need to practice for Sunday… so, over to Project Sweet Sound we go….